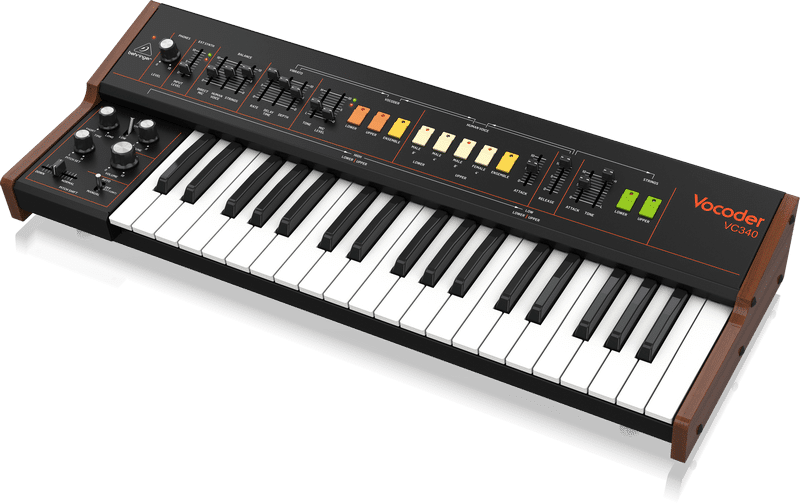 The Behringer VC340 is the faithful remake of one of Roland’s iconic analog synths; the VP-330 and it has been heavily anticipated. Behringer has been stepping their game up over the last few years and I believe this is a prime example. It is my opinion that the VC340 is a major win for Behringer as it is going to satisfy a lot of gear heads with its price range and quality. One of the problems with the old-school string machine vocoders is that they’re expensive and not always conditioned well. With the VC340, you’re getting a brand new instrument that looks and feels like a 70’s synth. 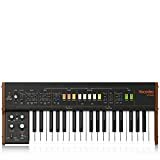 With a moderately low price, does the the Behringer VC-340 compare to other synths in its range? I believe it definitely does. There are a few exciting features that I will get into later in this article. With this being said, if you are a major synthesizer fan, I am also high on the Korg Minilogue XD and recommend checking it out as well. The VC-340 recently made it into my favorite synthesizers list that I have been adding to over the years. You can check all of these out at the link above. I mentioned above how retro this synth looks, but I have to say it again. This is such a cool looking synth in my opinion. The build quality on this keyboard is great and because of that, it’s a little bit on the heavier end. This was very common back in the 80s. Note: The VC-340 is very similar to the old-school Roland’s, thousands of dollars cheaper. Take this into consideration when trying to decide on your next piece of gear. I believe this is such a solid remake of the vintage synths and I think you will be quite pleased upon trying it out. Check out the demo of the sounds in the video below. A downside to the VC-340 is that it’s not going to be able to do everything that a synth like the Prophet 12 can do. It’s got its sound and it’s great for having that old-school string and pad feel for songs. To me, this is the coolest looking synthesizer that is modern. With this being said, I am also a huge retro fan. I love the look of older synthesizers. This looks like a Roland Paraphonic meets the Roland VP-330. If you are a fan of Roland products, you can read about my favorite synths of theirs here. It’s loaded with the colorful buttons that remind me of the 80s. The shell has the classic wood look that a lot of vintage synths have. The orange, yellow, cream and green buttons just scream 80s synth to me. As far as the appearance goes, Behringer killed it with the VC-340. The VC-340 comes with velocity-sensitive keys that feel pretty standard. 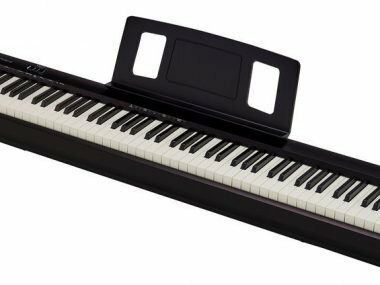 It has 37 keys, so it gives you some decent opportunity for lush chord progressions in both hands. To view some of my favorite 37 key keyboards, click here. Big win here for Behringer and the VC-340. I know that a lot of gear heads are going to be huge fans of this powerful synth. This is not your modern synth that is going to give you a ton of creation and sound-scape abilities. With this being said, it does what it does extremely well. The strings are beautiful as well as the choir pads and vocoder. I had the pleasure of playing and recording on a Roland Paraphonic a couple of years back and it blew me away with its strings. This synth did the same thing for me with the strings. I know I keep saying this, but it truly sounds like the 80s. Note: The human voices only sound realistic when the ensemble effect is on. Without that being on, it sounds very cheap. When using the strings, you can get a crazy cool effect by using the pitch shift. It will sound like a straight-up 80s song. The Vocoder works well and it very advanced in that you can use any XLR mic of your choice with it. Compared to other synths, this is easy to use. All of the buttons and effects are laid out right in front of you and there’s not a ton of different things you can do with it. It’s truly simple, but effective in my opinion. Note: When using the attack, this synth is classified as paraphonic. Yes, I know, paraphonic is a weird word and you’re probably thinking of polyphonic. This synth is also polyphonic too. What this means is that when you adjust the attack, you can only have a slow attack on the first note you press down. For example, the rest of the notes will play immediately when pressed. Who Is This Synth For? The VC-340 is for fans of synth-wave music. If you like bands like Depeche Mode, Pet Shop Boys, and New Order, you will most likely adore this synth. While you could use this for modern production, it definitely works better for retro music since it will immediately do what you’re looking for. For the most part, I would take this over most synths near its price range because I love what it does. You can also use it as a MIDI controller as well if you aren’t digging the retro sounds. 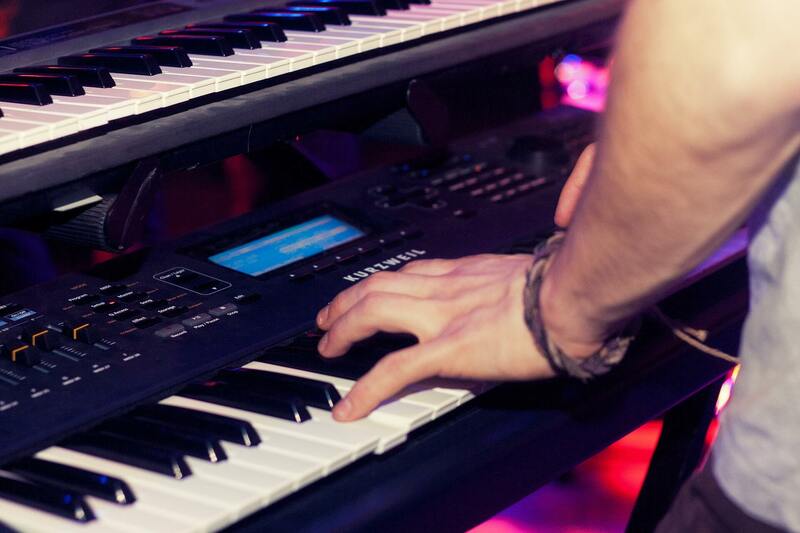 The Korg Minilogue XD is another great option that I mentioned earlier. With that being said, they’re totally different types of synths. 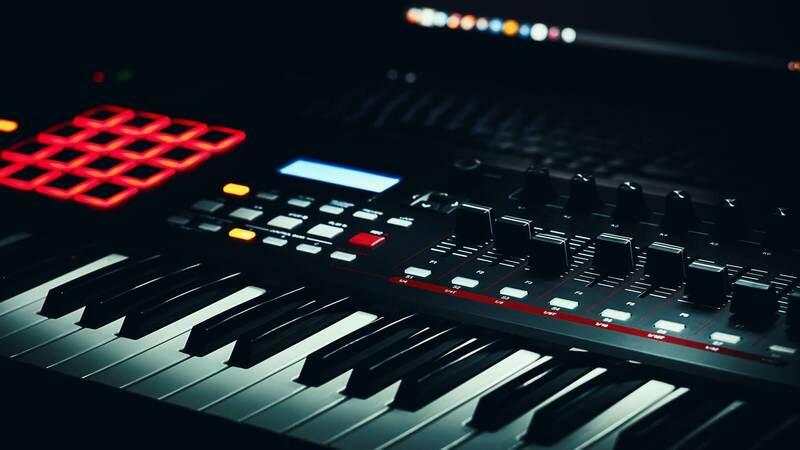 Here are some of my favorite 49 key MIDI controllers if you are into controllers. I believe this is Behringer’s best work thus far and I think this is one of the best synths near this price range. Personally, I absolutely love this synth and think it will be a complete hit. There is something about analog synthesizers that I just love. It took me a while to truly notice a difference in the sound vs a digital synth. 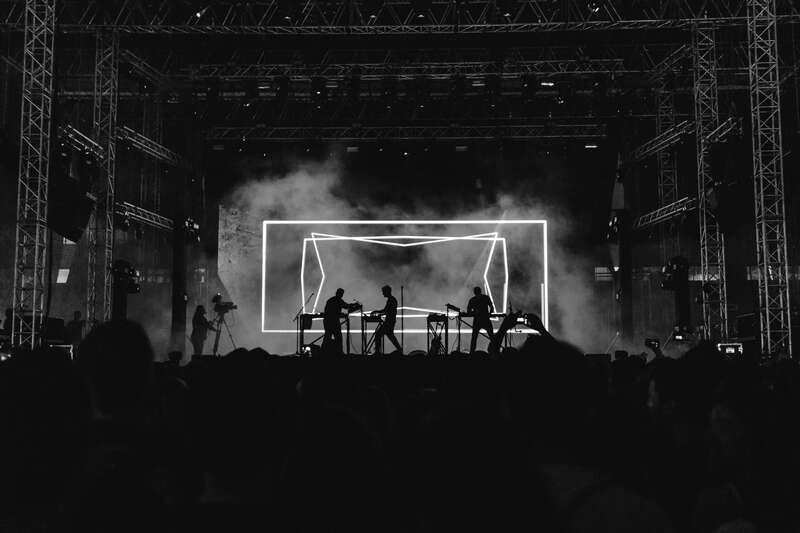 What really stood out to me was when I played some old-school analog synths. You can tell the difference in the pads and the Behringer VC340 nailed this element. I mentioned earlier that people spend thousands of dollars on the old-school versions of this synth. A lot of that is because they’re vintage, but some of that is also in part that they’re just great synths. If you are fan of vintage instruments, you can check out my guide to keytars here. If you are into 70s and 80s music, I think synth is 100% for you. Are you excited for this synth? Is there anything that you’re not digging about it or anything that you’re espeically digging? Let me know below!